Could Automating Food Services Create More Jobs? 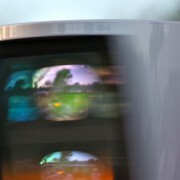 You are here: Home / Research / Industrial / Could Automating Food Services Create Jobs? While automation often causes fears of unemployment, history shows that robots can and do create jobs. Two relationships help explain how automation can increase employment: productivity gains relative to the price elasticity of demand for goods and services, and the shift from non-paid to commercial activity. 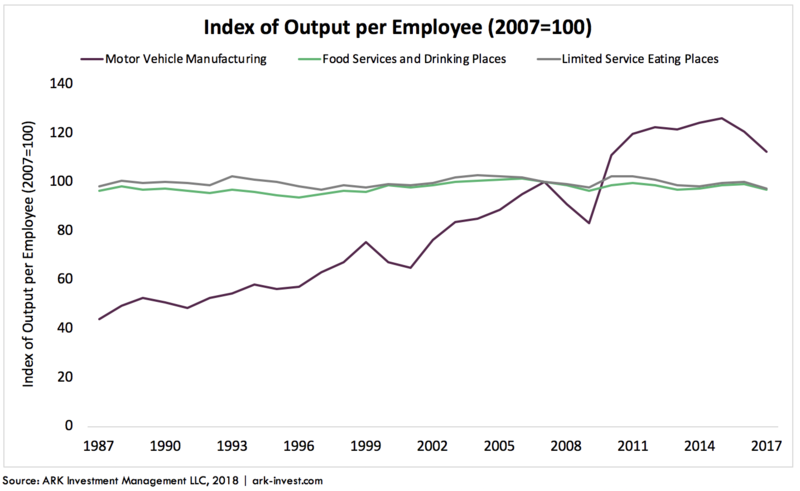 Productivity in the food services industry has been relatively flat for the past 30 years, quite a contrast to that in the motor vehicle industry which has nearly tripled, as shown in the chart below. Even though most industrial robots have been sold into the auto industry, auto employment also increased thanks to the growing demand for cars over time. 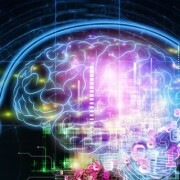 Automating food services could result in the same dynamic. Automation should lower the cost of offering food services, increasing the demand not only for out-of-home meals but also for robots and labor. 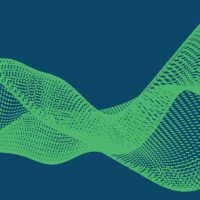 As long as the price elasticity of demand for out-of-home food services remains higher than the productivity gains associated with automation, demand should increase enough to accommodate more robots and human jobs. The shift from in-home to out-of-home dining is pushing “non-market activity” into the commercial market, increasing employment. Currently, Americans spend approximately $870 billion dining out. 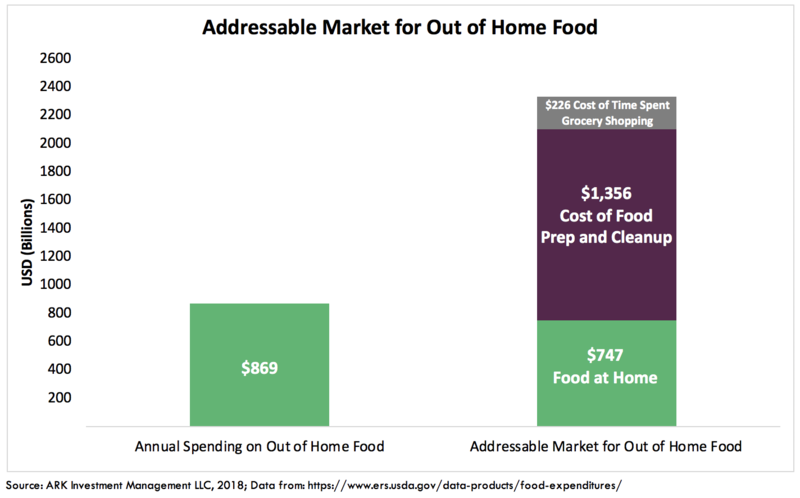 Based on our estimates, the addressable market for out of home food could increase significantally as the cost of dining out becomes competitive with the cost of eating at home. Food service statistics don’t include the value of time spent at home on meal prep and cleanup. In the U.S., the time spent at home prepping for and cleaning up after meals is roughly 36 minutes per person which, in the commercial market, would be worth $14.7 per day, or roughly $1.3 trillion annually when aggregated across the number of US adults. Similarly, grocery shopping, which takes six and a half minutes per day on average, accounts for more than $220 billion in non-paid activity excluded from economic statistics, as shown below. 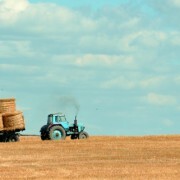 In other words, non-paid activity is worth more than two times the $750 billion currently spent on food eaten at home. 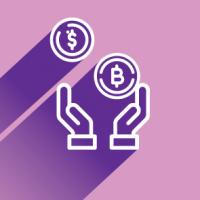 During the next few years, the demand for food services outside of the home should hit a tipping point, as the price elasticity of demand outpaces the productivity gains associated with automation. 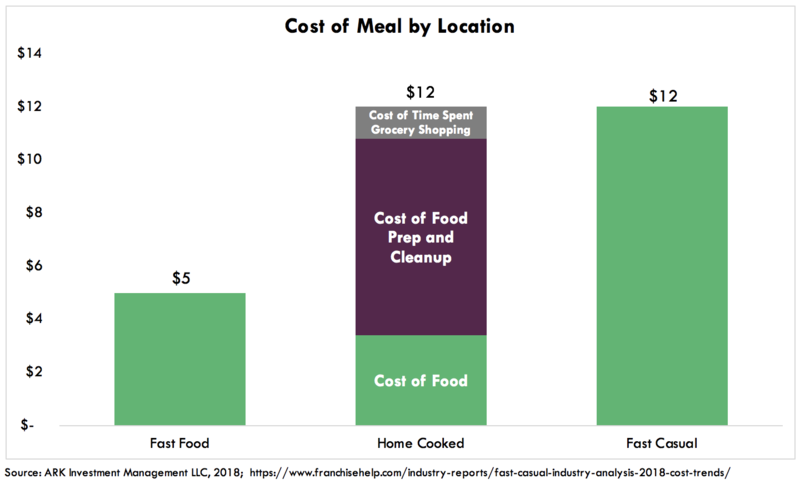 While the food for a home cooked meal costs roughly $3 per person, the time prepping, cleaning, and grocery shopping pushes its all-in cost to $12, which just happens to be the average ticket at a fast-casual restaurant today, as shown below. Because labor accounts for roughly 30% of food service costs, automation is on the cusp of pushing fast casual costs below those of eating at home. Because consumers don’t place an explicit value on their non-market activity, the impact of the drop in dining-out costs probably won’t be as sudden as the response to the drop in an electric vehicle price below a gas-powered car price. 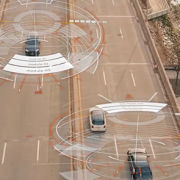 Instead, the share shift to out of home food spending will take place because of the convergence of convenience and cost, especially as autonomous cars, rolling delivery robots, and non-autonomous bike messengers transport food door to door. 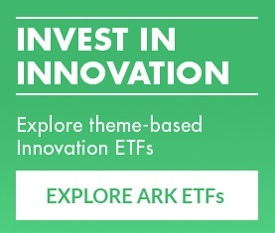 https://ark-invest.com/wp-content/uploads/2019/01/automated-food-services_robots.png 295 845 Sam Korus, ARK Analyst https://ark-invest.com/wp-content/uploads/2016/05/ARK-Invest-Logo.png Sam Korus, ARK Analyst2019-01-23 16:08:382019-01-25 18:55:10Could Automating Food Services Create Jobs?